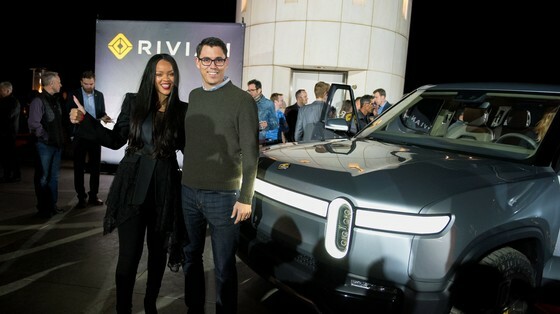 Kicking off the 2018 LA Auto Show, RJ Scaringe, with a celebrity assist, unveiled Rivian's all-electric pickup truck at the Griffith Observatory. Targeting outdoors enthusiasts rather than utility consumers, Scaringe said, "the electric truck is built not only for a smooth ride and rapid acceleration on the highway (zero to 60 mph in three seconds) — but also to climb over rocks and push through mud, sand, and chuckholed gravel off-road." As the ideal platform to go out and enjoy nature, Scaringe points out all the extra gear space made possible by the lack of an internal combustion engine. Auto show attendees can check out both the R1T and companion SUV, the R1S. Rivian plans to start selling both within two years by 2020, assembled at a former Mitsubishi plant in central Illinois. Rivian has developed a “skateboard” platform on which all its future vehicles will be built. A battery-based powertrain can be laid flat underneath the vehicle body and between the wheels. With no big gasoline or diesel engine, there’s more room for people and their stuff. The lower center of gravity lends itself to better handling, which holds true for most similarly configured electric vehicles, including Tesla’s. But the truck also will have a double wishbone suspension up front and multi-link suspension in the rear, more sophisticated than what’s found on most pickups. For Rivian, a lot will ride on new forms of distribution. The company intends to sell its cars over the internet, and it plans a subscription service that would allow someone to drive a Rivian “once a year, once a month, once a week,” Scaringe said. Click on "say hi" to start a conversation.